Breaking out the Sweater Vest! Boy, I have had NO time after the morning show to update the forecast...so my new goal is to update my blog DURING the show...so I got to apologize for the lack of recent updates. I finish the morning show and I get assigned stories to go to straight after the show ends. It has been quite a crazy week on the morning show. We had a chicken mascot in for a cooking segment and we had the chicken try to do the forecast...I had to jump on to help out the feathery friend. We also have had a lot of fun and some AMAZING video this week. We finally got the new bedroom furniture at home and I have been sleeping much better on the new bed. I am heading to Ann Arbor for a moped rally this week. I will try to snap a few photos while I am up there. Looks like a VERY chilly weekend. I was planning on camping out, but luckily someone has opened up their home for us to sleep in between our moped riding around town. Coolest weekend of the fall for us, on tap. Yes, the sweater vest made it's seasonal premiere today with a high finally in the 50's. I always wait until we get a high lower than 60 in the fall to finally break it out. Temps will rebound next week with plenty of sunshine. We just have to get done with a dreary day today, and a cool, but sunny weekend... and next week is looking FAAAAAANtastic! Have a good one. Something has been up with the blog site the last two days so I have not been able to post. I have enjoyed a few rounds of tuna salad during the morning show...very filling and healthy. I have been building graphics for our new seven day pop-out and also busy at home. I have steam cleaned the carpet and getting everything ready for our new bedroom furniture. It was delivered today and I out on the new mattress, sheets, and blankets. I jumped into the bed before my second shift today and man...it was REALLY hard to get out of bed...sooooooo comfy! I am heading up to Cleveland tomorrow for a wedding and then the Browns game on Sunday. I think my sleep on Sunday night will be severely limited, if not null. The weather looks a little iffy over the weekend with highs in the mid 60's and spotty showers. Most of us will stay dry, but there is a chance for rain. Next week we will warm things back into the 70's with more sunshine, just a cool, damp weekend for the first weekend of fall. Stay warm and dry, but most importantly...have a good one! Saturday Dawn and I went down to Dayton, Kentucky to spend the evening watching the Buckeyes on a friends boat. Buckeyes were a bust...going to be a long season. Sunday we got to meet Leroy Kelly, a Browns Hall of Famer who was in town. The Browns actually won and looked pretty good with only a few questionable play calls. My fantasy team also won, despite one of my players out with an injury. All-in-all a great weekend with nice weather. Dealing with a few spotty showers this morning to start the workweek. The showers will become more numerous this afternoon with a few rumbles of thunder possible. Temps will remain mild the next few days until showers and a cold front swings through late Wednesday. That will leave us in the mid 60's for the end of the week. Fittingly, fall arrives on Friday. Stay dry and have a good one! Last night we had Moped Monday at Nick's shop. I am totally jealous of his shop. I thought I had a decent working shop but nothing like his. I have never welded before and would have no idea on how to do it, but Nick was very generous and didn't hesitate to help out. The problem is that the previous owner of the Magnum (as pictured) put on new rear shocks that were over an inch longer than they should be. It looks cool because it really beefs up the back end of the bike, but it also made the drive chain rub into the frame. As a matter of fact it had cut a line right into and through the frame. We took off the surrounding parts that would be affected by the heat and Nick went to work welding the frame and made it look like new after grinding away, welding some more, and back to grinding... Huge thanks for that. I now have to try to sell the like-new shocks that are on there and get the proper size. It looks like we will see a few spotty showers and maybe a rumble of thunder later today as cold front number one swings through. The time frame looks to be in the later afternoon and early evening. By the time we head into the overnight hours the skies will begin to clear as we see a brief break before more scattered showers and storms return later tomorrow with cold front number two. We do not have a lot of moisture with this so not everyone will be seeing the rain. The good news is that we will really cool things off and we will go from a high of 85 today, to 72 tomorrow, to 63 by Thursday. The weekend still looks GREAT with plenty of sunshine and highs in the low 70's. Have a good one! Another GREAT weekend! We saw a few showers and even a few rumbles of thunder. Browns lost to the Bengals in an embarrassing game for both of them. Horrible play calling and horrible execution. Ohio State barely won, but at least the weather was nice. Waking up my third week in a row for mornings has gotten a little easier. Mondays are normally the hardest, but I am slowly getting used to rolling out of bed at 2AM. I think setting one alarm ten minutes early and laying there til 2AM is the trick. Then shut off the other 5 alarms at 2AM, haha. We had the local Dairy Council on the morning show to talk about health snacks and of course the morning crew loves getting to those snacks after we wrap up the show at 9AM. Today will be pretty nice with plenty of sunshine and a high around 80. More of the same tomorrow with a slight chance for rain later in the day and overnight as a cold front swings through the area. There will not be a lot of moisture with the system, but it will definitely cool us off into the mid 60's for the end of the week and next weekend looks GREAT again with highs around 70 and plenty of sunshine. Well time to head home and do about 15 loads of laundry. Have a good one! I got to be honest, it is hard to find time to blog on the morning show. There is NO down time to sit down for a few minutes to write up something. I am in the weather center now covering just in case Jeff Booth's live shot dies for Friday Night Football. As soon as his forecast is done then I am off and racing to my two football games tonight in Fairborn and Beavercreek. Heading to a few games farther from the station so I will have to hustle. As I have mentioned in my previous entries we are doing finishing touches on our bedroom before our new furniture and bed arrive. I spent one evening painting the trim in the bedroom and it made a big difference. The old trim was scuffed and not a clean crisp white paint like the new paint. The spotty showers will stick around for Saturday and Sunday, although they will be very widely scattered and most of the area will remain dry. Temps will continue to rise over the next week. Monday and Tuesday will be close to 80 and dry before a cold front swings through late Tuesday into Wednesday that will REALLY cool us off for later next week. Go Bucks, Go Browns, and have a good one! With my first weekend off, you would think I would take it easy, nope. I shot high school football highlights Friday night, woke up early Saturday morning and Buckeye and I went up to Cleveland. Dawn was the Matron of Honor for her cousins wedding. It was a very beautiful wedding and a lot of fun. I didn't get to watch the second half of the Ohio State football game, but the first half looked pretty good for the Buckeyes. I just hope the rookies can hold their own until all the upperclassmen get off their suspensions. Sunday we hung out at Dawn's parents house for the morning and watched our wedding video. Some people claimed that I was not on the dance floor very much, but according to the video, I never left. We finished that (and Six Pepper wings from Cleats, AMAZING!) and then went to Columbus for another wedding for my roommate from my freshman year of college. I got home in Dayton around midnight...only to wake up at 2AM for work. Dawn and I ran a few errands yesterday and then took a much needed afternoon nap. The chilly, cloudy weather made it much easier to nap. I then went over to a fellow mopeder's house in Kettering for our Moped Monday. I got the Magnum running, but needed to be tuned better and I did not want to finish tuning it at his place because it was so hilly and I need flat ground and long straight-aways to tune it properly. The drastic change in temperatures has really made things feel like fall. We hit 98 on Friday and yesterday we only hit 62, so a 36 degree temperature difference for the highs. Dawn made the comment yesterday while we were shopping that it almost felt like we were Christmas shopping seeing everyone bundled up. Temperatures will remain in the 60's for the next few days and with the addition of rain and winds, it will feel down-right raw. We will slowly warm up over the week ahead, but only into the mid-upper 70's for the weekend ahead. The moisture from Tropical Storm Lee will bring us scattered showers for the next few days and unfortunately we could see a little rain over the weekend as well. Stay warm and dry and I will see you back on here soon. Have a good one! Yesterday, definitely hot...today, hotter. We warmed up to 96 for the high yesterday, and today I am calling for a high of 97. I stayed at work and shot some video and then worked on my moped in the afternoon. 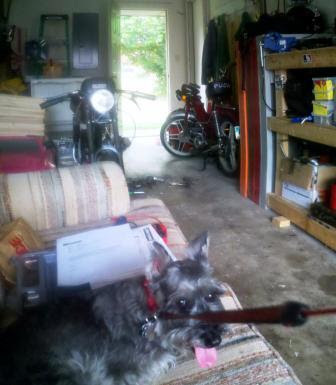 Buckeye was loving our old couch in the garage. With us getting new furniture, I have it for sale on Craigslist and it is just taking up space in the garage until we get rid of it. I know I was sweating a lot, but there was one point where I was just blown away at how much I was actually sweating...drenched. I am shooting high school football highlights again tonight then off to Cleveland early tomorrow morning. I am going a wedding on Saturday in Cleveland and then a wedding in Columbus on Sunday. Dawn is actually the Maid of Honor for the Cleveland wedding. Rain will arrive late Saturday and we will have on and off showers and storms Sunday. Labor Day could have a few early morning showers, but should be dry for the rest of the day and MUCH cooler, with only a high in the around 70. Next week looks to remain cool and really nice. Stay cool, dry, and have a good one!